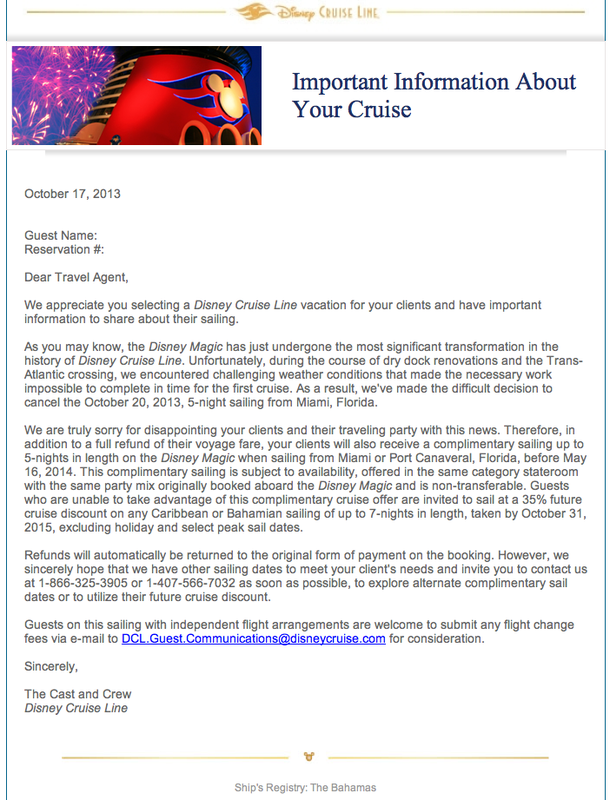 The October 20th sailing of the Disney Magic has been cancelled. Disney Cruise Line is citing challenging weather conditions which made it impossible to complete the finishing touches following during the transatlantic crossing. Guest affected by the cancelation will receive a full refund as well as reimbursement of airline change fees. As additional compensation passengers are being offered a complimentary sailing on the Disney Magic between now and May, 2014. Passengers who are not able to take advantage of the free sailing offer on the Disney Magic will receive a 35% discount on a future Bahamian or Caribbean cruise, taken within two years and excluding holiday sail dates. We appreciate you selecting a Disney Cruise Line vacation for your clients and have important information to share about their sailing. As you may know, the Disney Magic has just undergone the most significant transformation in the history of Disney Cruise Line. Unfortunately, during the course of dry dock renovations and the Trans-Atlantic crossing, we encountered challenging weather conditions that made the necessary work impossible to complete in time for the first cruise. As a result, we’ve made the difficult decision to cancel the October 20, 2013, 5-night sailing from Miami, Florida. We are truly sorry for disappointing your clients and their traveling party with this news. Therefore, in addition to a full refund of their voyage fare, your clients will also receive a complimentary sailing up to 5-nights in length on the Disney Magic when sailing from Miami or Port Canaveral, Florida, before May 16, 2014. This complimentary sailing is subject to availability, offered in the same category stateroom with the same party mix originally booked aboard the Disney Magic and is non-transferable. Guests who are unable to take advantage of this complimentary cruise offer are invited to sail at a 35% future cruise discount on any Caribbean or Bahamian sailing of up to 7-nights in length, taken by October 31, 2015, excluding holiday and select peak sail dates. Refunds will automatically be returned to the original form of payment on the booking. However, we sincerely hope that we have other sailing dates to meet your client’s needs and invite you to contact us at 1-866-325-3905 or 1-407-566-7032 as soon as possible, to explore alternate complimentary sail dates or to utilize their future cruise discount. Guests on this sailing with independent flight arrangements are welcome to submit any flight change fees via e-mail to DCL.Guest.Communications@disneycruise.com for consideration. This entry was posted in News and tagged Disney Magic, Miami, Re-Imagined Disney Magic by Scott Sanders. Bookmark the permalink. I think I made a comment about that challenging weather in a earlier post. Wow, this would be a huge disappointment to anyone thinking they were going to be first to sail on the reimagined Magic. Bill, our bags were packed and ready to go. All our bags were packed as well. TOTAL bummer to the end of the week. Disney has put 4 ships in the water and not missed their inaugural sailing dates. Just figures its the one I’m on!! In fact they have, check out this thread on the DisBoards: http://www.disboards.com/showthread.php?t=3139130 regarding cancelled/changed cruises. 3/12/98 Magic Maiden Voyage — Moved to a date in either April or May and then finally to July 30, 1998. Yep: moved ahead by a week. Not that this helps, the disappointment about your cruise being cancelled stays. Geez Scott I didn’t know that but probably should have. I can’t imagine how depressed you (and the family) must be. I book my trips almost a year out. If I got to within 2 days of sailing and it got cancelled I don’t know what I would do. Hopefully you can get in on that complimentary trip even though it won’t be the same. Really sorry about that. Thanks Bill. We aren’t depressed yet (I’m Scott’s wife). We are trying to get on the 10/27 Magic or the 10/20 Dream and are still on the 10/25 Magic. Emily & Scott if you have time read post #8 on this page over at DVCNEWS.com. It is a story about how Disney went the extra mile and a half for this couple on their 25th. It is stories like this that keep me coming back to Disney even though on occasion they have peeved me pretty good with some of their cost changes. I think you will have to copy and paste the link in your browser. THEN, we are still on the 10/25 2-night and our TA was able to book us on the 10/27 for our free cruise. We are lucky, as we live in FL and have no scheduling issues or airfare to contend with. Pet sitter available and it seems like it all aligns. I, for one, think DCL did great for compensation. I was not expecting our cruise to be cancelled 3 days prior, lose our double dip, cabana, Palo brunch with friends, etc., but I also didn’t expect a free cruise or space held for us on 10/27. I feel bad for those not as lucky for sure. The Dream Is doing a 4-night Bahamanian cruise (Nassau, Castaway Cay, sea day). DCL may not have given you that option because it sold out in moments of the Magic announcement. When we checked at 2:30pm, there were only a few rooms in Cats 4A-C. Our travel agent worked on our rebooking from 2:30pm-7pm with most of the time spent on hold with DCL. She snagged us the Dream cruise only when a client of one of the other agents in her travel agency released their room. Scott, I’d REALLY like to thank you for how quickly you posted this. Despite my tremendous disappointment, I saw your post 12 minutes after it went up- completely by chance, got RIGHT on the phone and we are rebooked for Nov 1. It won’t be the same- I’d booked this sailing for the double dip and the Bahamas, and my kids are still upset- we were supposed to travel today, so they were down to one more sleep, but at least the magic will still happen for them. Thank you very much. Doesn’t really matter, everything else is SOLD OUT and you MUST GO ONLY ON THE MAGIC to get the complimentary cruise! Wow, that really does stink, but kudos to them for stepping up and offering considerable compensation. Have you checked for 5 night cruises on the Magic on the website and selected Caribbean? There aren’t 5 night Bahamian ones but there ARE plenty of Caribbean options. Cozumel and Castaway Cay or Cozumel and Grand Cayman, plus sea days. I’d like to know also how you explain this to a 7 year old as we booked it in April!!!!! She’s been counting down for SIX MONTHS!!! my mother is a Disney employee and purchased the tickets just like any other guest to go on this cruise for our family. it is understandable that there’s nothing they can do about the cancellation but the fact that cast members do not get a complimentary cruise as promised to any other guest is complete bull***t. just goes to show how Disney treats their employees. absolutely absurd. Donna Alsei, I booked in August 2012. I’m beyond disappointed, and the other sailings are not what I want for an itinerary. It is beyond sad. I wish they would recreate the sailing. Were will Magic go? Is it headed to Nassau? Home port. It is not showing up on ship tracker. Could go to CC Sat Sun and tie up. Do not expect to see at PC due to Fantasy and Dream due in. The Magic is coming to Port Canaveral on Friday. There is berthing space at Port Canaveral down the channel near Jetty Park for the Magic to sit while the Dream & Fantasy are at the terminal this weekend. Disney you need to think about the customers first and not your profit. This is not the first time this has happen with Disney. The Disney Dream first cruise was a joke, now the Disney Wonder had to cancel in January 2014 and now Disney Magic. What next for this cruise line I am very disappointed in Disney and Disney Cruise Line. You up the prices on the Cruise and Parks but the service is VERY POOR both the Cruise and Parks. You need to shape up and stop look a the dollar bills. You are going to be like all the other Cruise Line Soon. Almost a year of planning, coordinating travel plans making paper chain to count down the days, saving the money, making sacrifices to pay for the vacation just to be pushed out into the water. Unreal! The Magic is pulling into the channel at PC right now (10:50am CT). I still haven’t told my kids. I heard them wake up talking between them about how they were going to see Mickey on his “new boat”, playing in the splash park, riding on the slide. Its going to be really taumatic for them. The problem is that Disney doesn’t sell cruises, they sell the promise of “Magic” and the experience. Delayed gratification doesn’t work well with the young ones. My money is locked up in that cruise to be refunded to my credit card in a few days. We’re stuck. No more 5 night cruises in the period they are requiring the new cruise to be booked. No even trades. To partially quote our vice president – “this is a BIG…Deal” (and a bad one). Thank you for the information Scott! We were SO excited to go. LOVE your blog! Atleast you get a free cruise or 35% discount. I was on the fantasy last October during hurricane Sandy. Captain Tom drove the ship straight into the hurricane. Boat was rocking at 45 degree angles back. Plus, when we finally docked everybody was in the lobby, like a herd of cattle. When they finally let people leave after standing there for two hours, my niece ( she is 7) got a black eye. They only gave us a 25% discount. Plus, we didn’t even get to stop at castaway cay. It was a nightmare that would never end. The free cruise is limited to very few dates in 2014, even though there is availability on other sailings. The “press” is better than the offer.